There has been many films that explored the U.S. space program, most notably The Right Stuff. This new film puts the story in a more personal perspective in the hands of La La Land director Damien Chazelle and written by Josh Singer, it is based on the book First Man: The Life of Neil A. Armstrong by James R. Hansen. Armstrong had famously made the "one small step for man, one giant leap for mankind" as the first man on the moon. It's hard to imagine there are conspiracy groups who are convinced the moon landing was a faked. Hopefully they will have a new appreciation for the skill and sacrifice that these American heroes so rightfully deserve. 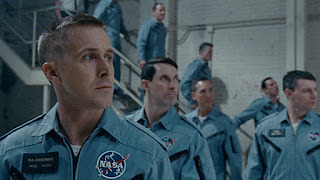 The movie opens with Neil Armstrong (Ryan Gosling) as a test pilot of X15's in the early 1960's. The action puts you right in the pilot seat with Armstrong, hearing the vibrations, roar of engines, and the sound of his breathing as he takes the plane to edge of space. He gets a glimpse of the darkness beyond before losing control of the craft bouncing off the atmosphere as he fights to get back to earth. Neil risks his life everyday, but at home he tries to have a normal life with his wife Janet (Claire Foy), his son and his 3 year old daughter who is fighting cancer. Her passing weighs heavily on Neil. He applies for a new program at NASA. The training of the future astronauts tests their endurance to withstand what they may experience in space. Meanwhile, Janet has another child and makes friends with the wives of the other astronauts who all live in the same neighborhood. The space program is spurred by the support of President Kennedy and the race with the Russian program. But the loss of human life also takes a toll. The first Apollo team is met with tragedy. The politics of the world is changing. People think all the money spent on the space program should be put somewhere more helpful to the populace. The night before the moon mission Janet has to force Neil to say goodbye to his sons since there is always a chance they will not see him again. The journey to the moon is detailed to the most visceral experience ever displayed in a movie. There is a point of view perspective that brings one to feel the claustrophobic space capsules. The dials of the controls, the whines and shaking as they hurtle into space powered by burning fuel beneath them. The wonder as they look out the small windows to see earth from space, a small blue marble floating in the void. They are so well trained for the mission but it doesn't take away from the actual excitement of being the first human to plant their foot print on the moon. Ryan Gosling gives a stand out performance as he internalizes the angst of losing his daughter and the loss of his friends in the program. He gives Neil a stand up attitude to getting his job done fearlessly. It's people like him who can think quickly and without panic that opened the door to space exploration. First Man right now is one of the best of the year.